Happy Monday – April 18th! Welcome to the best day of your life so far in 2016. Why not make this the day you do that thing you have putting off? Nike’s slogan just do it is not that far off the truth. 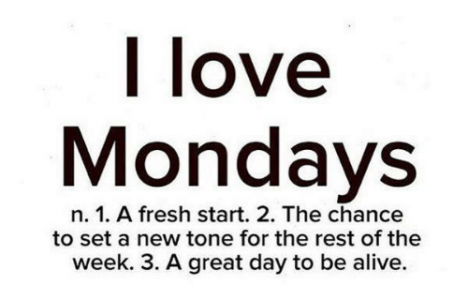 Let’s do this thing called Monday with a little passion. With a little fire in our hearts. How many steps do you actually think you can get in? How far down the rabbit hole do you wanna go this week? Do you wanna take the red pill or the blue pill this week Neo? So today on the first day of the week, blow the top off the popsicle stand! Go for the gold! Go for it like you have nothing to lose. Albert Einstein is quoted as saying that there are two ways to live. You can live as if everything is a miracle. Or you can live as if nothing is a miracle. The miracle could be thought of as your own life. The fact that you are alive right now and reading this is pretty amazing. In your life you are either moving forward or moving backward. Either you are stepping towards your goals or you are not. Either you are growing or you are not. So the question is: What are you going to do with this amazing miraculous opportunity today? How many amazing interactions can you have with people? How much movement can you get in this week? I would guess it is a lot more than you think. So step up to the plate! Go for the gold. Crush those goals! And rock this day with your awesome self! Today I want you to just show up and give today your best shot. Just show up and be who you are. Just show up and rock this day with your most authentic self. You didn’t sleep well last night? Just show up anyway and go for it today. You got worries and concerns about the day? Who doesn’t? Just show up and tell those worries to go away. 90% of your worries never come true anyway. You have just had the worst day of your entire life? Just show up today and keep moving forward. Because it you ain’t moving forward then you moving backwards – just saying. You Don’t Need A New Year to make a change…. All You need is Monday. Make this the week you change your life! Get moving today and keep being awesome!